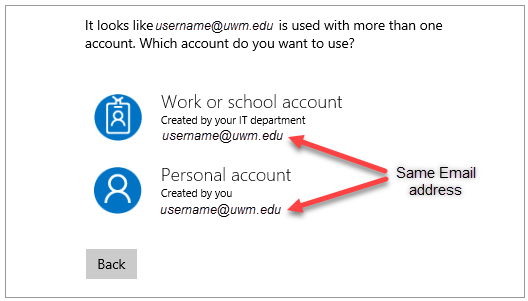 If you use multiple accounts with the same email, Microsoft gives you the option to rename your personal account. If you're tired of seeing this prompt, you can rename your personal account, which means using a different email address to sign in to it. Doing this changes the way you sign in to your account, but it won't impact any of the data associated with it. Renaming your personal Microsoft account can help simplify your interactions with Microsoft applications, products, and services by separating your work activities from your personal activities. However, this process cannot be undone. In some scenarios, renaming your personal account may not be helpful. You use a Windows phone running Windows 8. You will have to reset your phone. You are part of our Xbox Developer community. You could lose access to some developer tools. Look under the Account alias section. If your work or school email address is the only one listed, enter your personal email address, or get a new one from Microsoft, and select Add email or Add phone number. Going forward, you'll sign in to your personal Microsoft account with your personal email address. You might need to sign in again to some apps and Windows devices.